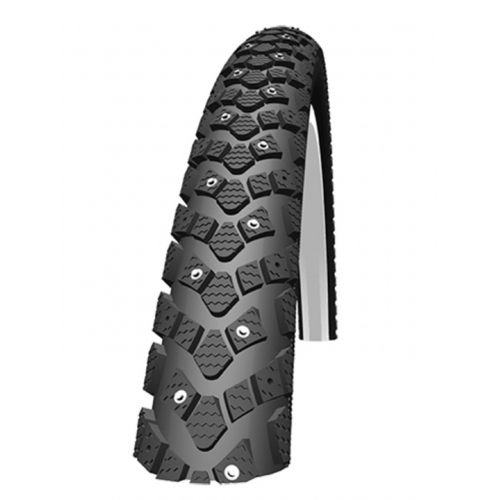 Similar in appearance to Schwalbe's Marathon Winter tyre but with fewer metal studs and at a lower price. The tyres are fairly expensive. To economise you can fit just one to a bicycle. If you do this, we recommend that it is fitted to the front wheel as losing traction at the front almost always results in a nasty uncontrollable fall. For tricycles with two wheels at the front and velomobiles, we suggest that a single studded tyre be used at the rear. Otherwise you run the risk of losing directional control and the bike flipping over when the tyres regain grip. The Winter has a dynamo track to optimise working with a dynamo lighting system. We try to keep the tyres in stock but if we run out it can be difficult for us to get them once winter is in progress and demand is high. Therefore, we advise that you consider ordering your studded tyres before the freezing weather starts.